Home Nutrition and Diet Which is The Ideal Dog Food for Great Pyrenees? Which is The Ideal Dog Food for Great Pyrenees? Wondering how much to feed a Great Pyrenees puppy or adult dogs? Or you just want to provide optimal nutrition for your pet with allergies or a certain medical condition? Find out in five minutes or less. Let's start. When I first joined a rescue center in Atlanta, GA I had the luck to work with a snow-white pup, the fluffiest one I’ve ever seen. To be honest, at that time I knew nothing about this breed and what Great Pyrenees eating habits are. For the next six months, until she was adopted, Bonny and I had a fantastic time and I learned so much about this breed and their nutritional and training needs. In this post, I’ll go over this frequent question of “which is the best dog food for Great Pyrenees?” I’ve listed several brands for adult dogs and my favorite pick for puppies along with tips for common health problems and allergies. The Great Pyrenees need as much caloric intake as an adult human would need. However, their nutrition differs from our diet, and every bag of dog food is different in their nutrient density. A typical Great Pyre can be called an “Easy Keeper” when it comes to food intake vs. another giant breed dog needs. Meaning, they tend not to eat as much as other dogs their size. Their proof of health is typically in the coat. That white mane of fur can say a lot about their diet and health. To keep their coat, the luxurious Pyrenees need plenty of healthy fats in their diet like omega-3 and omega-6. Let’s talk fad diets: The reason most fad diets work is the same reason they work for humans. 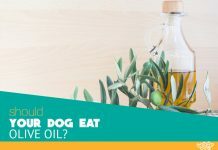 If the dog goes from eating food that is comparable to doughnuts and then switches to food with the complete nutrition, there will be an obvious difference. The reasonable goal is to feed healthy house dogs a few steps above “dollar store” dog food. 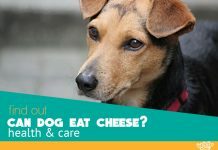 This is not the same recommendation for dogs that have health issues or are overweight, more to come on that topic later. Pyr nutrition should be similar to most large breed puppies. Feed at least twice a day. After the puppy has been altered caloric needs may change, discuss any changes with your veterinarian. As far as the specific brand, this is my favorite pick. Purina Pro Plan Puppy Lamb and Rice has everything a growing Great Pyrenees needs in their early stage of life. Including the important DHA. It is readily available so being able to stick with the food is easy. Keeping a puppy’s immune system healthy should always be a priority. It’s also one of the better tasting dog foods on the market. For Example, puppies are at risk of developing demodectic mange more than any other time in their life. Demodex mites naturally live under the hair follicles. It is usually a result of an immature or weakened immune system that hair begins to fall out, and treatment is necessary. It is important to know that not every name within a brand is considered quality. Some of lowest quality food inside a brand, like Purina, is the equivalent of feeding a dog nothing but doughnuts. The higher quality foods, however, are perfectly acceptable dog foods. Purina has been in the market of making dog food for over 100 years. Their product is easily accessible and consumed in tons which means the product on the shelf is normally fresh. Like most companies Purina strives for quality and have voluntarily recalled products in the past. Nutro’s mission is to give food with real recognizable ingredients. They deliver their promise in the first ingredient with deboned lamb, and a list of wholesome foods to follow. This food has the omega fatty acids a Great Pyrenees needs. It is also a large breed formula that includes glucosamine and chondroitin to protect joint health. Royal Canin is one of the only brands to offer a Giant Breed formula. Being one of the most researched based dog foods on the market, the nutrition, size, shape, and texture of the kibble are altered, depending on the breed. Since larger breeds are notorious for swallowing food whole, the kibbles are designed to encourage chewing. This food also contains glucosamine, chondroitin, and DHA for joint health. Purina ProPlan is at the top of its class of dog food. It is also readily available at commercial pet stores and some grocery stores. ProPlan has the joint health formula like most giant breed food has and the omega fatty acids calculated into their analysis. Purina has a 100-year reputation of giving pet owners quality food for their pets. Purina One and Purina ProPlan are similar foods. The difference here: the joint health ingredients and omega 3 are not formulated into the name. However, there are many dog owners with limited choices in where they can buy dog food. This one can be found in common retail and grocery stores and is usually the best product offered at those locations. It is an affordable and good quality, with soft and hard kibbles, that most dogs enjoy eating. The Great Pyrenees are prone to certain health problems. These health problems can include; ear infections, hip dysplasia, plaque and gingivitis, heart problems, cancer, eye problems, orthopedic ailments, and bloat. Highly reputable breeders will already take the steps necessary to have their pups screened before adopting out to individuals. At the very least good breeders have medical history on the parents. They will also take the puppies for a general health check-up to their veterinarian and provide documentation. However, many health problems can develop years later. That is why routine checkups at the veterinarian are so important. Some clinics will recommend a physical exam twice a year and annual blood work as a basic wellness suggestion. Since dog’s age seven years to the human’s one year, it is important to take them in for checkups to catch problems quickly. Health problems in animals are like health problems in humans. Sometimes there is absolutely nothing that can be done to prevent what may happen. Other times, it all goes back to good nutrition, proper care, and exercise. For instance, routine ear cleanings can help prevent ear infections. Bloating can be prevented by a common surgical procedure called a Gastropexy, or tummy tack. Veterinarians may recommend a tummy tack early in the dog’s life for deep chested breeds, or after a dog has experienced bloat, so it is a good question to ask during puppy visits. Some heart problems and orthopedic issues can be prevented through diet and exercise. Also, to keep the heart healthy dental care can have a huge impact. After a pyre reaches two years old, it is a good idea to discuss annual dental care as well. Once a year dental scaling will keep all that bad oral bacteria from entering their body which can affect the heart, liver, and kidneys. Obviously, there is no one product that will work for every Great Pyrenees. Once a Pyre, or any dog, put on weight it can be a challenging uphill effort to lose it. Sound familiar? Discuss caloric intake with a veterinarian. Some clinics have to treat handouts to take home. With a little math finding the correct feeding amount is obtainable. Still not slimming down? Consider thyroid testing. It may also be worth asking about something called Science Diet Metabolic prescription food. This is a food formulated to help dogs lose the weight by working with their metabolism. So, they lose weight while eating enough. Furthermore, patients show less of a chance of the weight returning when switching off the prescription diet. Let’s talk about food allergies. Food allergies can be a hard road to travel. The typical recommendations begin with getting a better brand of dog food and cutting out chicken and beef. This can be difficult because treats and other things have these ingredients hidden inside. In severe cases, it may be necessary to have blood drawn for an allergy test or start a hypoallergenic trial. If an owner decides a RAW food diet is the best option for their pet it is strongly recommended to consult an animal nutritionist before starting anything. Otherwise, gastroenteritis, colitis, and pancreatitis are all very real and expensive ailments that can happen when feeding an improper diet. Great Pyrenees Mountain Dogs were bred to guard livestock and their people in the Pyrenees Mountains of France and Spain. Some of the first mentions in the history of these dogs come from travelers in the 1400s writing that they guarded the chateaus of Lourdes. Even King Louis the XIV employed these dogs within his household guard. Many of these beauties still hold their position in the harsh climate and prestigious surroundings. Others can be found in the back country of the southern USA guarding chickens. Mostly, nowadays, they will be found inside the family home sporting a copious amount of white fur and weighing between 80-120 pounds. They are an easily recognizable breed. Besides their weight and white double fur which they shed continuously to resist matting. The Great Pyrenees have long squared muzzles long ears, and soft deep eyes. Some, particularly males, can be rather barrel chested and their tail is hooked into a shepherd’s crook. Because of their patient and gentle nature toward children Great Pyrenees make excellent family dogs. They are charming and affectionate dogs with a strong precautionary instinct. This can make them territorial and suspicious of strangers. Without training and proper socialization, they can become a giant slobbering nervous dog. Patience is imperative to success when training such an intelligent and independent animal. Furthermore, as with any silly puppy, the earlier class starts the better. Training is important with all dogs however giant breeds offer different motivation. New owners can begin training at home as soon as they arrive while they are a manageable size. Puppy classes are a great place to socialize and learn proper dog behavior. Chewing is a sign of teething or boredom. To curb this behavior, and spare good boots, offer strong, durable toys like a Kong or NylaBone. Ohh and they love ball launchers and other fetch toys. I had a blast with iFetch Too. Whatever toy they do receive it must be appropriately sized. Otherwise, they can swallow something and cause an internal obstruction. Furthermore, most of the other behavioral issues stem from the lack of socialization and exercise. 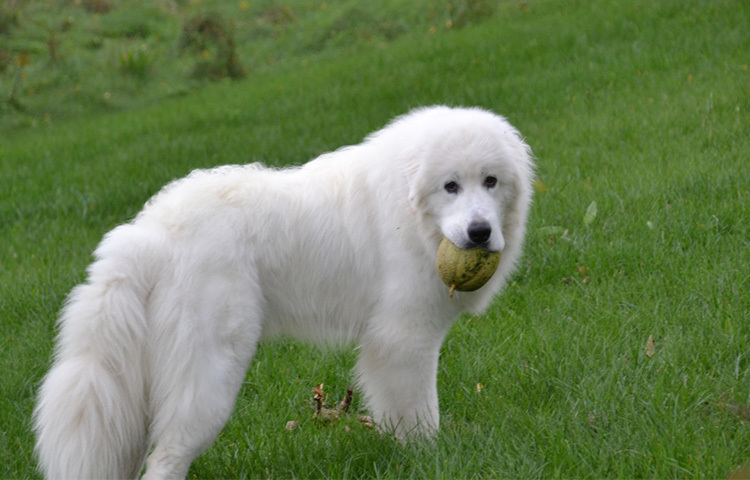 As a warning, Great Pyrenees will bark at anything that may pose a danger to their home. To avoid a noise complaint, it is possible to teach them to be discriminating in warnings. The wandering Pyrenees is a breed staple. Spaying or neutering the Pyrenees with help with that problem. This procedure eliminates the hormonal need to wander and find a mate along with other physical ailments. Such as a pyometra in females, and prostate cancer in males. Nervous aggression is usually found in those adult Pyrenees who were kept in close quarters, chained, and ignored. With a gentle approach and knowledge in animal body language, this behavior can usually be conditioned out. The Great Pyrenees is like many other wonderful dogs. Loyal, affectionate, funny, and full of individual personality. Because of their large size owning this breed can be expensive when it comes to basic up keep and preventative medicine (don’t forget the heartworm prevention). But that giant fur ball is worth it. 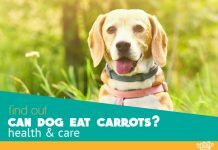 When it comes to choosing the perfect dog diet for Great Pyrenees, consider your dog’s age, health condition, and activity level, you can’t go wrong with any of above-mentioned choices.